How are insurtech companies determining the future of the insurance sector? Only a few years ago, the insurance sector was made up of a number of large companies that dominated the market. The functioning of this industry seemed unchangeable, as well as the relationships between insurance companies, insurance brokers and insurance agents, built and consolidated over many years. Everyone knew the rules of the game and knew which role they played. Until the arrival of the Internet and the new technologies that are available to anyone, which has caused a change in the classic power balance between companies and consumers. This change, which has given more power to the insured at the disadvantage of the insurers, will thus have the consequence of a radical change in the ways of defining and selling insurance products and services. Murray Raisbeck, partner in KPMG London and Head of Insurance Technology, spoke about this and what insurance companies can do in order to not lose market share in an interview published on the blog InsurTechTalk. In this post we summarize this interview. 1. Who is driving the change in the insurance sector? Raisbeck’s answer to this question is emphatic: the consumers and their new expectations. For KPMG’s Head of Insurance Technology, it's very clear that consumer expectations have been re-defined by the online shopping experience they have with companies such as Amazon. These kind of experiences set the tone for any other online purchases, despite the company, nor the product or service that is being purchased, nor the sector that the company operates in. That means that consumers expect the same ease of buying a book on Amazon as buying insurance online. And the problem for traditional insurance companies is that they are having a hard time adapting to this change that consumers require. 2. 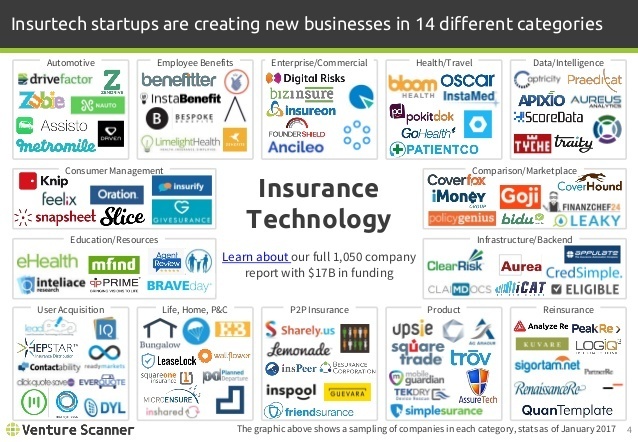 Where are insurtech startups headed? 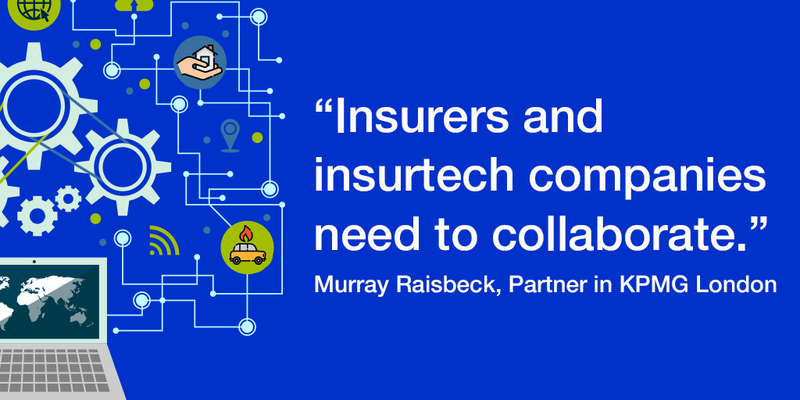 Despite the fears that the proliferation and growth of insurtech startups can provoke among the traditional players in the market, Raisbeck sees“the need for insurance companies and insurtechs to collaborate and associate much more often”. According to Raisbeck, this is because practically no insurtech startup is trying to become the new insurance company of the future. Rather, each one of them is using technology to specialize in those fundamental activities of the value chain where they know they can make a difference, whether in insurance distribution, customer acquisition, purchasing and managing insurance policies, etc. 3. What barriers do traditional insurers face to advance in this new digital economy? The main barrier is the speed in adopting new technologies. While insurtech startups are dedicating all of their time to determine how and what technologies can help them to enter new markets and offer an added value to their clients, executives from insurance companies are barely dedicating 5% of their time to think about what type of technologies they should adopt to better meet their customer demands. The rest of their time - 95% - has to be dedicated to dealing with internal bureaucratic procedures, team management, IT problems, regulatory questions, etc. Currently, companies often consider technology as one of the pillars of strategy, and this is also one of the main errors of traditional insurers: they don't consider technology as a factor underlying the whole strategy, and therefore must be the common denominator of any plan or strategic decision. Consider what investments are being made and make a decision: is it essential to allocate capital to legacy IT systems or products with a low return on investment? What is advisable is to focus the investing efforts on high growth businesses and on those technologies that will allow the company to reach their customers as they require. According to Raisbeck, traditional insurers that are moving in the right direction are the ones that have two management teams: one dedicated to continuing to manage the business, as it has been done so far, and the other focused on determining how technology will redefine the business, and secondly, which technologies to implement (and not the other way around). How to use lean principles within a traditional management structure. 4. What can insurance companies do today? The specialization of insurtech companies that we discussed in point 2 is really great news for traditional insurance companies, as this represents an opportunity to associate or collaborate with them to enter new markets together, explore new technologies or try to provide greater value to their insurees. But before establishing new alliances, it is advisable to test if the solution proposed by a future insurtech partner is one that will work for your insurance company. How can you do that? Raisbeck recommends to organize innovation challenges, a type of contest in which the insurer launches a specific challenge or problem that they would like to resolve. Then, insurtechs sign up to participate and provide solutions. A good organization of these types of events will get at least 30 insurtechs that want to participate. Evaluating the solutions proposed, the insurer will select 5 or 6 companies as finalists, whose proposals can have a real impact on their business. And of these, finally only 1 or 2 will be chosen to close a collaboration agreement and move on to a pilot phase: testing the solution in the market. It is essential to validate the solution proposed by the insurtech with real clients to know if the collaboration between the insurer and insurtech will work. If it all fits, the insurance company can begin to refine the collaboration and create a product that truly satisfies the needs of their insurees. The 10 trends in the insurance sector for 2017 (1st part). What is a robo-advisor and how will it transform the insurance industry? Why insurance companies should use electronic signatures?